Envelop your skin in moisture and softness with the L’Occitane Almond Cleansing and Softening Shower Oil, a rich and luxurious formulation that cleanses and hydrates in one step. When this extraordinary formulation comes into contact with water, it transforms into a lavish, softening foam that is unique in texture. Enriched with almond oil, it respects the hydrolipidic film and leaves a subtle and mouth-watering scent of fresh almond. The skin is left enveloped with a satin-like softness all over the body, and skin appears refined, supple and toned. 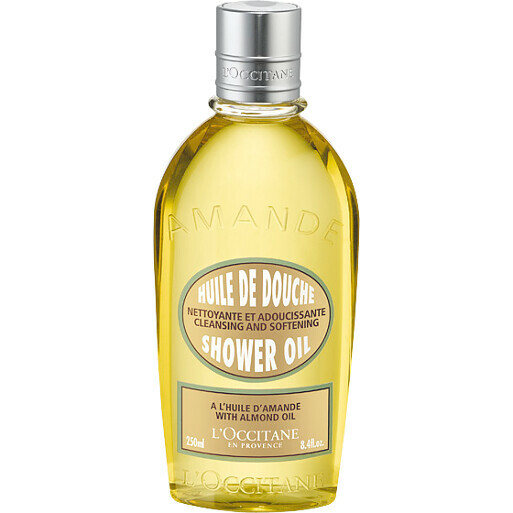 L'Occitane Almond Cleansing and Softening Shower Oil 250ml is rated 4.8 out of 5 by 12. Rated 5 out of 5 by Sue17 from My favourite shower product In my opinion this is the nicest shower product on the market. It foams up beautifully and has a gorgeous smell, not too overpowering. The oil makes my skin silky soft and leaves me feeling truly pampered.